Jay Laga’aia was born in South Auckland. An avid rugby player until he busted his shoulder and his islander mum made him quit, Jay knew there had to be more to life than getting fat or going to prison. So he set off to Australia, where he ended up on Play School, in Star Wars, and playing Mufasa in the Lion King musical. Jay’s all about keeping it simple, enjoying life, and having fun… and making silly voices. Mwamvita: Could you please introduce yourself to us? Jay: Ta-da! Oh, sorry. I’m Jay, hi. Mwamvita: Nice to meet you, Jay. Hope: When and where were you born? Jay: I was born in South Auckland, New Zealand. ‘Once Were Warriors’ territory. In a land far, far away [mock American accent]. Mwamvita: Can you please describe your childhood and what you spent most of your childhood doing? Jay: Um, I come from a large family of six. Having a large family nowadays is unique, whereas back then you had to have a family of six, otherwise nobody would look after the little ones when you went to school. So I think I had a great childhood; I grew up in South Auckland and we had music, I learned to sing at church and at school as well. But I was a rugby player. I was Under 18, Under 19 New Zealand Rep, and I busted my shoulder and my mother said, “No more rugby”. And island mothers always beat out coaches, so yes, I had to find another job. Hope: You said that you were a rugby player; what made you want to have a role in the show Play School? Jay: Wow. Um, because I realised that I sucked as a rugby player. I’ve been doing Play School over 16 years, but before that I’d been working in television. I started working in television in ‘83, before your parents were probably born. And I came over to Australia in ‘95 after I did a tour of Jesus Christ Superstar to work on a show called Water Rats. And I have been here ever since. And in ‘99, the producers of Play School came to me and asked me if I would like to audition – cos I didn’t just get in, I had to audition – and so they just asked me to tell a story and sing a song. So I told one of my favourite stories, which was The Three Billy Goat Gruff, and my favourite part of The Three Billy Goat Gruff is when the troll jumps out and goes, “Who’s that walking on my bridge? Trip-trap, trip-trap on my bridge! Why you little billy goats! [laughs] I’m going to eat you up”. And you can’t tell stories now about people eating people cos it’s not PC. Jay: Oh and PG! Sorry, you’re a video girl. Parental guidance is necessary. Um, but other than that – and that’s why, I mean, I enjoy working in the preschool sector. Because that is the future of our country. Mwamvita: So can you please tell us when did you start playing guitar, and how were you inspired? Jay: I started playing when I was 10. I learned really quickly that you don’t blow into a guitar, because it’s not like a saxophone. But uh, because everyone at home – you find a reason why a lot of Polynesians play guitar [is because it’s] really hard to drag a piano to a party. So you know, you end up playing guitar or ukelele or, you know, you learn to play piano at church when everybody is not in church, and then you get caught out – but anyway that’s another life. But yeah, I think you’ve got to learn a musical instrument. I play several different musical instruments, and it helps me not only in my career but also just as a writer. Hope: What dreams did you have for your future when you were younger? Jay: Oh, just to be rich. Hope: How achievable did you feel [your dreams were]? Jay: Not really, not much! [laughs]. You know, you’ll find poor people dream about being rich a lot more than rich people dream about being rich. I think I wanted just to be – I knew that there was something more, cos I didn’t want to end up like my cousins and my friends and their families that are around. Cos they either got fat or got in prison, you know, or they just ended up living in the same street telling the same stories. And for me, I wanted something more but I didn’t know how to do it. So I fought with my parents a lot, and then I set out to try and find a life, really. And I’m still looking. Hope: That’s very brave. Do you have dreams for the future now? Jay: Yeah to get to lunch time, that’s basically it. I find – you know what, people always ask me, “How do you judge a good performance?”. For me, I keep it really simple. Did I fall off stage? No. Great show. Joyce: Can you tell us about the Lion King audition? Jay: For me, the Lion King audition um… I auditioned in Auckland, and I typically went to the place where the Lion King audition was – which was above McDonald’s in Queen St. And the South Auckland boy in me sat down, looked at McDonald’s, and went, “I could get an ice cream and not go to the audition. Or I could go to the audition. I could get an ice cream and not go to the audition!”, and then a voice in my head said, “Or you can go to the audition and then come out and have an ice cream”. And I just went, “Ohhh” [exasperated sigh]. “We’re doing the Pride Rock scene today, so are you ready to do the Pride Rock scene?” And I went, “Um. Yes. I am”. So I stood there, took a deep breath – now I remember that James Earl Jones voiced Mufasa, but he also voiced Darth Vader. 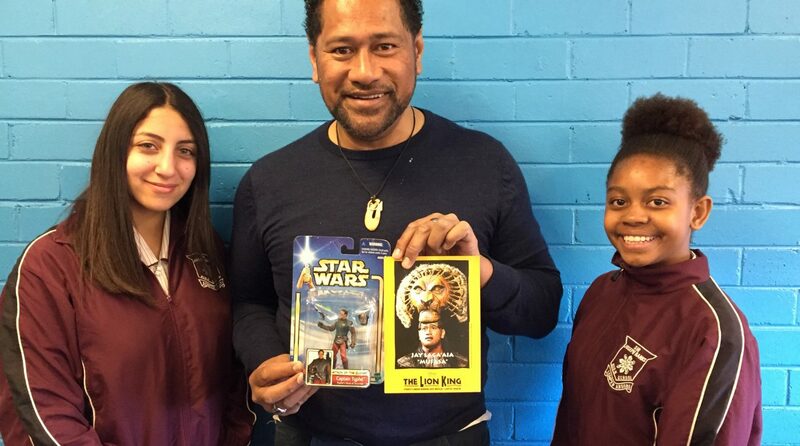 So the South Auckland boy in me decided that I will just do Darth Vader as Mufasa, without the asthma. Cos that’s how clever I am. That’s how we roll in SA. So I stood there and they went, “When you’re ready, Jay”, and I went “OK”, and I took a deep breath and [cleared my throat]. In my head I was going, “Mufasa, Mufasa. Darth Vader, Darth Vader”. And I went, “Everything the light touches is our kingdom. A king’s time arises and falls, like the sun. One day, Simba, the sun will set on my time here, and will rise with you as the new king”. And they went, “That’s fantastic, Jay, that’s great!” I got offered the role, I flew to Chicago to see the opening of their touring group. And as soon as the opening stanza, “Naaaaants ingonyamaaaa, bagithi baba”, I was crying like a baby [mock crying sounds]. And that was the last preview, and then I went to opening night the next night… cried again. So I did about 800 shows, and most recently toured with Wicked. I played the Wizard. And next year – nobody knows this, but I’ll tell you cos this is an exclusive – I’ve accepted a role with Packemin, which is an amateur professional. That’ll be at Riverside. And we’re doing Shrek in February. And I will be playing, “Donkey! You can’t do that, that’s ridiculous!” So I’ll be playing Shrek. Without the makeup. Mwamvita: Can you please describe your life outside TV and how your normal life is? Jay: My life outside work is, I’m an Uber driver. No. I just – my 17-year-old daughter is a state netball rep, so I have to drive her to places. My two sons are also performers, they did School Spec last year. I’ve got two of them that are doing featured artist this year. My 12-year-old daughter and my 15-year-old son who’s at Newtown Performing Arts, so they’re doing this. My son’s just finished doing Miss Saigon at Riverside, and my other one’s just doing Dreamgirls with the Rockdale Operatic Society. So I drive everywhere. If it’s not soccer, swimming, rugby or whatever, I’m in my car. And I spend most of my time going, “What park, just tell me what park it is”. So that’s my life. Joyce: And your experience in Star Wars? Jay: My experience in Star Wars is – look I got a role in Star Wars, I looked after Natalie Portman and I worked on Episode II and III. And I’ve always been a Star Wars fan, and so getting to meet all my idols, getting to – I’ve got light sabres, and I’ve got a whole bunch of other stuff – but people ask me, “What’s so cool about being in Star Wars?” Well, what’s cool about it is I got a toy, too, so I’ve got a figurine that looks just like me and you can’t have it. Hope: What advice can you share with others who may be going through similar experiences that you have overcome? Jay: Look, I think the biggest thing is that we always tend to put ourselves down because it’s a lot easier than building ourselves up, alright. Choose a job you truly enjoy, you’ll never work a day in your life. Nobody can make you feel inferior without your permission. And most importantly, there’s an old Chinese proverb that says, “The best time to plant a tree is 20 years ago. The next time is now”. So we spend most of our time going, “I can’t do this because of this”, or “I can’t do this because of that”. Plant your tree. If you wanna be successful, if you wanna be rich, plant your tree. Joyce: And can you take us out with the Play School song? We’ll all sing along. All sing Play School together.